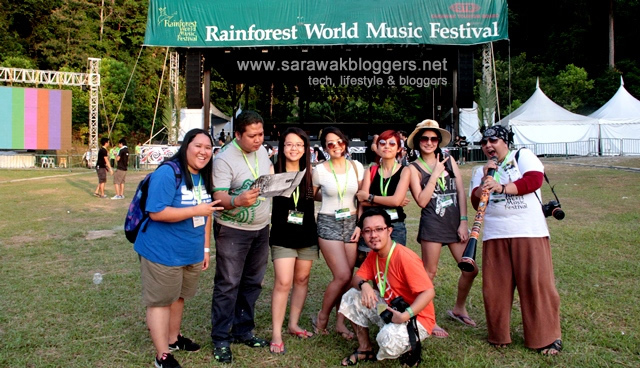 The massive yearly event of the Malaysian music calander year, the Rainforest World Music Festival (RWMF), saw eight bloggers under the Sarawak Bloggers given the opportunity to yet again cover the award winning fest. Thanks to the Sarawak Tourism Board (STB), these eight bloggers which come from all over Malaysia, with a majority of them Sarawakians, were given the ultimate privilege to enjoy the biggest music fest in Malaysia as media, which is a privilege not many can boast of. Aside from free usage of the media centre, the Sarawak Bloggers were allowed to have unlimited time for interviews with the performing artist, which includes dining at a designated area meant for media and performers. The bloggers were also treated to unlimited internet coverage during the fest at the media centre, with a few lovely souvenirs given to them as remembrance. Aside from that, resources at the media centre were also provided for free with the bloggers given special unrestricted passes to the the full four day event. Aside from the RWMF, the bloggers also covered the Borneo World Music Expo which was held at Hilton Hotel, Kuching. For those of you wanting to know more about what the bloggers did, kindly visit their blogs as listed below. To the Sarawak Tourism Board, we thank you for allowing us to cover the RWMF for yet another year! Previous articleGoogle I/O 2014: New Android L coming soon! Here’s the specs.